With the group still sitting around in the barn, Maggie slowly enters with Aaron and Sasha following behind. Everyone arises with guns drawn. Aaron tries to extend out his hand but pulls back when the group appears cautious. Aaron begins to make his case for Rick’s group auditioning for his community. While still going through the speech, Rick marches over and knocks Aaron out cold without any words or hesitation. Michonne worries that Rick took the wrong tone, but he immediately sets up a perimeter and gets Aaron secured. Aaron wakes up and gets questioned about the number of people waiting outside. Aaron turns the question back on Rick to help highlight Rick’s trust issues. Rick continues to distrust Aaron throughout his plea, but Michonne counters and says they should at least try to check it out. Maggie, Glenn, Abraham, and Rosita agree to join Michonne on the trip. Rick sends the rest of the group out to post watch around the barn. Aaron tries once more to make his plea for the good between both of their groups, but Rick remains vigilant with his distrust. Michonne’s group makes their way down the road and comes up with their own cautious plan to stay safe. 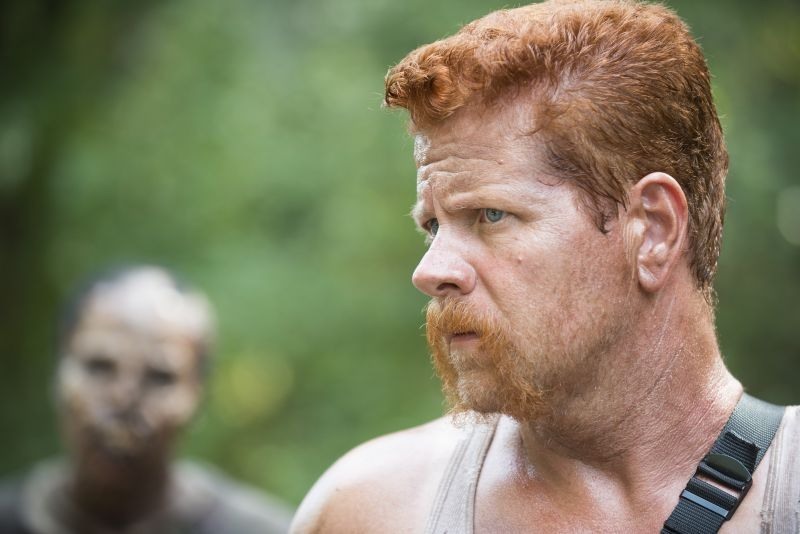 Glenn is concerned with Aaron’s spying, but Michonne seems to have much more confidence in Aaron’s honesty. In the distance, a figure watches. With Judith crying, Aaron offers Rick the applesauce from his pack. Concerned for his own safety, he convinces Rick to at least take it. Rick forces Aaron to take the first bite. Aaron makes another effort to convince Rick, who only decides to remind Aaron of his time to live. Machine’s group finds the vehicles but is startled by a sound in the woods. They are surprised to find that a couple of walkers pop out rather than people who were with Aaron. They enter the RV and find that Aaron’s pleas may be real. They bring the vehicles back to the barn, where Rick just claims the food. Rick still is unsure about saying yes. Michonne pushes the group to say yes and asks for anyone else to disagree. Rick finally says yes. Aaron gets uneasy about not driving and clams up when Rick wants to know exactly where the community is. Rick devises a plan to go up a different road and travel at night. Outside the barn, Michonne questions Rick’s uneasiness, but he recounts their troubles with Woodbury and Terminus. Unsure that he will be convinced to take his family in, he at least agrees that they should still go see for themselves. Rick finds license plates in the glove box, to which Aaron says that he is trying to collect all 50 to put in his house. Michonne notices that there are no people in the pictures Aaron brought, and she finally realizes that they never asked Aaron the questions. He admits to killing a lot of walkers and two people for trying to kill him. They then find the listening device but are distracted when a pack of walkers show up and splatter over the windshield. Breaking out of the pack, they try to clean off the car but struggle to get the engine to start back up. In the distance, a flare goes off and Aaron goes chasing after it. Rick, Michonne, and Glenn follow suit, but the walkers are right behind them. Glenn almost gets taken out and finds and saves Aaron from a similar fate. While he is about to let Aaron go, Aaron reminds him that they can try to make it to safety together. Rick and Michonne call and search for Glenn, but Rick has to use the flare gun on a walker. This only attracts more, but also leads to Aaron and Glenn finding them. The group moves out to Rt. 16 but cannot find Aaron’s friends. 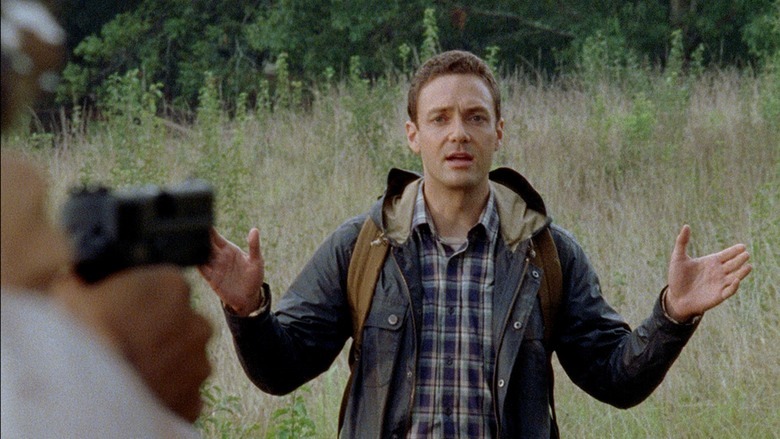 Rick’s entire group finally meet back up, but Aaron immediately searches for his friend, Eric, who has injured his leg. Aaron is so relieved that he shares a moment with Eric and lets his guard down. Eric reveals that he found another plate for the collection, but Aaron admits that he lost the car. Rick walks in and breaks up the reunion. Aaron then readdresses the group and thanks them for saving Eric. He finally names that the community is at Alexandria. Rick continues to exert control and tries to keep Aaron and Eric separated, but Aaron refuses to let it stand. Glenn takes a moment to speak with Rick and convinces him to let the two men stay together for the night. The following day, the group continues their run toward Alexandria. Aaron and Noah share a moment and talk about their injuries. 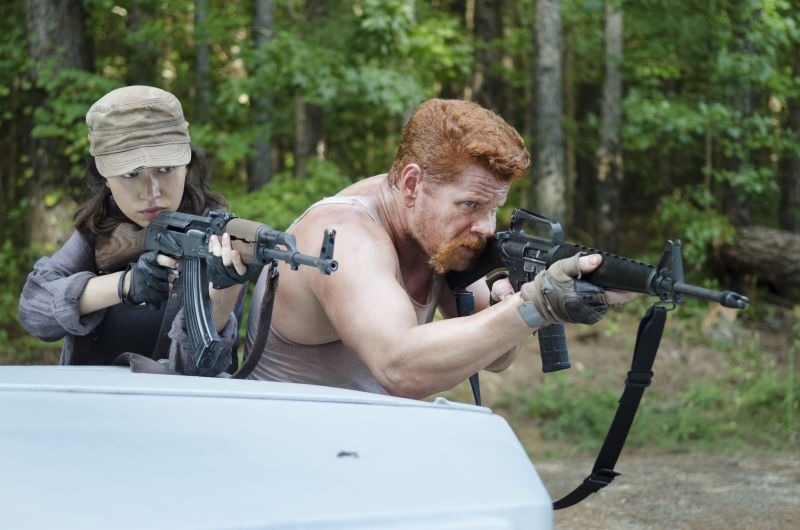 Rosita points out to Abraham that DC is in the distance. The RV breaks down, but Glenn finds a spare battery near the side door. Michonne and Rick talk off to the side about the fight. Michonne tries to convince Rick that he needs to let go of the fight. Rick remembers that Bob gave him that advice at the church. Glenn gets the RV back up and working, but Rick takes a moment to himself in the woods. He hides a pistol in blender outside of a house just off of the road and returns to the group. As they drive up to the gate of the community, Rick waits for a moment before getting out of the car. They hear kids playing and laughing, and Michonne smiles at Rick for the potential beyond the wall. He gets Judith and Carol takes a moment to acknowledge his methods. Reaction: I will admit that I had to catch this on the replay because of the Oscars, but I stayed up to watch it anyway. The episode’s main theme is about trust. Aaron trusted that Rick would eventually agree to join his community, but Rick was resistant through every stage of the process. He punched Aaron rather than listening to him. He tied him up. He forced Aaron to test the food before Judith could eat. He refused to let Aaron drive or take his suggested route. He refused to listen to Aaron when the flare went off in the distance. In reality, Rick cannot be blamed for his distrust. He has seem civilizations that have deceived him and his group and led to the death of close family and friends. The lack of trust was not a loss of hope, but it is clear that Rick needs a lot of evidence to feel comfortable agreeing to give up any minuscule amount of control. If I were Aaron, I would have lost trust in Rick’s group a while ago. It is not clear how much Aaron was able to hear using his equipment, but Rick was really being bull-headed throughout the entire ordeal. He was fortunate that Glenn and Michonne had some sense to check Rick at the right times. Michonne has grown significantly, Rick is learning to maybe consider that hope still exists, and the rest of the group is more than ready for a new life. Let’s see if the community is ready to accept these new people.